1 Tb of Alovette Garlic and Herb cheese spread, or whatever brand available to you. Cook spaghetti as directed on package and drain. Set aside. In a large skillet, add butter and garlic. Sauté the garlic until you start to really smell the aroma. Add oregano, salt and pepper, and sauté a few minutes more. Add shrimp, cook until pink, add spinach and cook another 3 to 4 minutes. Remove the shrimp and spinach from pan, set aside. Add flour to pan and mix with drippings to make a light colored roux. Add milk, cheese spread, and Parmesan cheese, stir well. As this thickens, you may need to add a little more milk. Return shrimp and spinach to the skillet, mix well and simmer about 5 minutes. Turn off heat, add drained pasta, toss and serve. 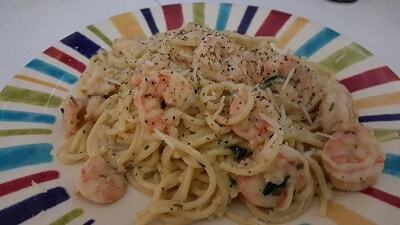 Top with more grated Parmesan cheese and cracked pepper if desired. Recipe and photo used with permission and is provided by Harold Wagner Jr over at Bubba and Earls Outdoor Grilling. Give them a visit and tell them we sent ya!